The implementation of major legislation such as the Affordable Care Act (ACA) often results in fiscal outcomes that differ significantly from prior projections. Whenever this happens it leads to many questions, much confusion, and several claims and counter-claims. Rarely is it immediately clear whether the law is working differently than envisioned, or whether the unexpected outcomes are due to inevitable projection errors having nothing to do with the law. On rare occasion, however, a prior projection proves so far off that its significance must be noted. Two weeks ago my colleague Brian Blase uncovered such a development with respect to the ACA’s Medicaid expansion. Recall that the ACA considerably expanded Medicaid eligibility – an expansion made optional for the states in a later Supreme Court ruling. It turns out that the 2015 per-capita cost of this Medicaid expansion is a whopping 49 percent higher than projections made just one year before. Translated into layman’s terms this just means that sicker people tend to have less income. Thus, the lower-income people previously eligible for Medicaid were more likely to be in poor health than the relatively higher-income people in the expansion population. This higher-income expansion population, being in better health, would be less expensive to cover. It was also thought then that among the newly-eligible population, the sickest would enroll first and the healthier individuals later, causing per-capita costs to drop during the next few years. The 2013 report projected that the per-capita cost for newly eligible adults would be just 1 percent lower than previously-eligible adults in the first year, but a good 28 percent lower in the third. The 2014 report offers some explanations for the unexpected cost increase, but I’ll return to those after discussing the results for 2015. Heading into 2015 the actuaries still expected costs per newly eligible adult to drop (by 22 percent, from $5,488 to $4,281) as healthier individuals enrolled. But instead they rose by 16 percent (to $6,366). Thus 2015 per-capita costs are 49 percent higher ($6,366 over $4,281) than previously predicted. Why were 2015 costs so high? The 2015 report speculates that some costs incurred in 2014 were reported in 2015. But reporting those costs in 2014 wouldn’t have meant they were any less underestimated. It would just mean that more of the underestimation happened in 2014 than 2015. Again a translation may be in order: Basically states established far higher expenditure requirements for the expansion population than the federal government expected, by positing that beneficiaries would be in need of more health services. Why did this happen? Remember, the ACA established an initial 100 percent federal matching payment for state Medicaid expansion costs, contrasting with historical federal match rates that averaged 57 percent. Even when the feds paid 57 percent of the bill there was a longstanding concern that states were insufficiently accountable for their cost-expanding decisions, with much of that cost being shifted to federal taxpayers. But the ACA’s current 100 percent match means that states make the decisions about expanding Medicaid while the federal government picks up all the costs. Even after the ACA is fully phased in, the feds will still pay for 90 percent. Under such arrangements, cost overruns are predictable. The fact that the states set payment rates higher than the federal government expected carries additional implications. If the states set payment rates too high for the expansion population, then per their risk-sharing arrangements with insurance plans some money will flow back to the federal government. 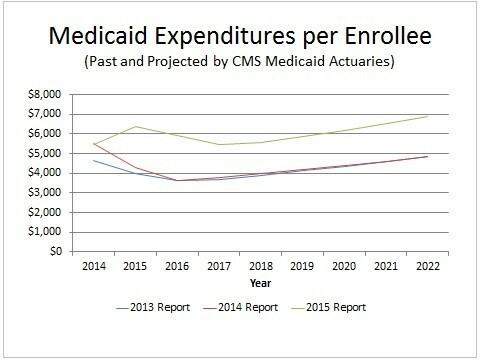 If this happens to the extent the Medicaid actuaries expect, recent per-capita costs will be about 9 percent less than shown in the 2015 report – though still dramatically higher than estimated last year. The slight uptick in CBO’s latest cost projections reflects higher enrollment as well as growth in per-capita costs. 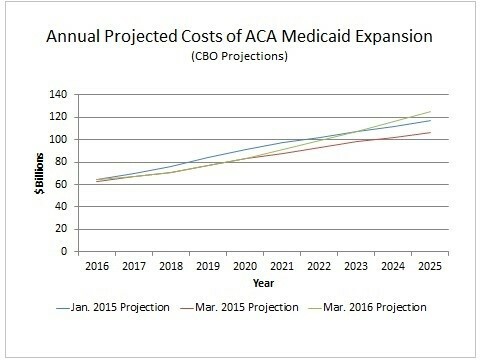 If the latest Medicaid actuaries’ report is any indication, future cost projections may well get significantly worse. Thus far CBO’s adjustments to per capita costs do not appear to fully reflect an increase of the magnitude shown in the latest Medicaid report. Remember also that the program’s actuaries still assume that due to risk-sharing payments and other factors, per-capita expansion costs will decline in 2016 and 2017. If this assumption proves incorrect, future costs will be higher still. Having federal taxpayers pick up between 90-100 percent of the cost of state Medicaid expansions was one of many questionable policy decisions made in the ACA. It’s also proving to be much more expensive than the federal government expected. This piece was originally published in Economics 21, a website of the Manhattan Institute. Is Trump Trying to Game the Presidential Debates?